According to canon law, the FSSP is a "Clerical Society of Apostolic Life of Pontifical Right". It is not, therefore, an Institute of Consecrated Life and members take no religious vows, but are instead bound by the same general laws of celibacy and obedience as diocesan clergy and, in addition, swear an oath as members of the society. The fraternity's pontifical-right status means that it has been established by the Pope and is answerable only to him in terms of its operation (through the Pontifical Commission Ecclesia Dei), rather than to local bishops. A local bishop still governs the fraternity's work within his respective diocese. In this sense its organization and administrative reporting status are similar to those of religious orders of pontifical right (for example, the Jesuits or Dominicans). The FSSP consists of priests and seminarians who intend to pursue the goal of Christian perfection according to a specific charism, which is to offer the Mass and other sacraments according to the Roman Rite as it existed before the liturgical reforms that followed the Second Vatican Council. Thus, the fraternity uses the Roman Missal, the Roman Breviary, the Pontifical (Pontificale Romanum), and the Roman Ritual in use in 1962, the last editions before the revisions that followed the Council. 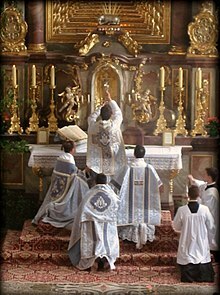 The 2007 motu proprio Summorum pontificum has authorized this older form of the Mass, known as the Tridentine Mass, not only for the fraternity, but for all Latin Rite priests as an extraordinary form of the Roman Rite, when celebrating Mass "without a congregation". Its use for Mass with a congregation is allowed with the permission of the priest in charge of a church for stable groups attached to this earlier form of the Roman Rite, provided that the priest using it is "qualified to do so and not juridically impeded" (as for instance by suspension). Following from its charism, the fraternity's mission is twofold: to sanctify each priest through the exercise of his priestly function, and to deploy these priests to parishes. As such, they are to celebrate the sacraments, catechise, preach retreats, organize pilgrimages, and generally provide a full sacramental and cultural life for lay Catholics who are likewise drawn to the rituals of the 1962 missal. In order to help complete its mission, the fraternity has built its own seminaries with the goal of forming men to serve the fraternity. For the honour and glory of the holy Catholic Church, for the consolation of the much troubled faithful, and for the peace of their conscience, the undersigned, members until now of the Fraternity of Saint Pius X, declare with profound regret over the illicit consecration of bishops on 30 June  that they have remained within the Catholic Church as pars sanior of this same Fraternity, and that they have but one desire: to be able to live as a religious society in this Church and place themselves at her service under the authority, of course, of the Roman Pontiff, her supreme head. The FSSP was established on July 18, 1988, at the Abbey of Hauterive, Switzerland, by twelve priests and twenty seminarians, led by Josef Bisig, all of whom had formerly belonged to Archbishop Marcel Lefebvre's Society of Saint Pius X; they were unwilling to follow that movement into what the Congregation for Bishops and Pope John Paul II declared to be a schismatic act and grounds for excommunication latae sententiae due to the consecration of four bishops without a papal mandate. Josef Bisig became the fraternity's first superior general. As of November 2018[update], the fraternity included 460 members: 304 priests, 14 deacons, and 142 non-deacon seminarians in 129 dioceses spread among Australia, Austria, Benin, Canada, Colombia, France, Germany, Great Britain, Ireland, Italy, Mexico, Nigeria, Poland, Switzerland, and the United States. The fraternity's membership represents 35 nationalities, and the average age of its members is 38. The lay Confraternity of Saint Peter enrolls 5,859 members who spiritually support the fraternity's charism. The FSSP's current superior general is Andrzej Komorowski. The Vicar General and Assistant is Patrick du Faÿ. The International Seminary of St. Peter in Wigratzbad-Opfenbach, in the German state of Bavaria (Diocese of Augsburg), was established in 1988. It serves French and German-speaking seminarians. Its current rector is Abbé Patrick du Faÿ. Our Lady of Guadalupe Seminary, in Denton, Nebraska, United States (Diocese of Lincoln), was established in 1994 and serves English-speaking seminarians. Its current rector is Pater Josef Bisig. Ezekiel House, a house of formation for first-year seminarians, exists in the city of Sydney, Australia. The Director of Ezechiel House is Duncan Wong. In 2015, the fraternity established in Guadalajara, Mexico, Casa Cristo Rey, an apostolate which it plans to develop into a house of formation for first-year seminarians for native Spanish-speaking postulants. Presently, Casa Cristo Rey serves as a priestly discernment program for young men from Spain and Latin America. In 2016 Casa Cristo Rey opened the Junipero Serra Spanish Institute, a program offering 6 or 8 weeks of Spanish immersion for priests and seminarians. Until 2012, the fraternity also operated an American boarding school: St. Gregory's Academy in Elmhurst, Pennsylvania. ^ a b c d e "What are we?". The Priestly Fraternity of Saint Peter. June 9, 2010. Retrieved June 10, 2010. ^ "Decree erecting the Priestly Fraternity of Saint Peter, 18 October 1988". Documents. Priestly Fraternity of Saint Peter. October 18, 1988. Retrieved June 10, 2010. ^ "History of the North American District". What are we?. Priestly Fraternity of Saint Peter. June 9, 2010. Retrieved June 10, 2010. ^ "Motu Proprio Summorum Pontificum on the "Roman liturgy prior to the reform of 1970" (July 7, 2007) | BENEDICT XVI". w2.vatican.va. Retrieved 2018-12-29. ^ "Excerpt of the Constitutions of the Priestly Fraternity of Saint Peter". Documents. Priestly Fraternity of Saint Peter. June 29, 2003. Retrieved June 10, 2010. ^ "Declaration of intention by the founders, 2 July 1988". Documents. Priestly Fraternity of Saint Peter. July 2, 1988. Retrieved June 10, 2010. ^ "Audition of the Auditors II". Synodus Episcoporum Bulletin. Holy See Press Office. September 30 – October 27, 2001. Retrieved June 10, 2010. ^ Devillers, Arnaud (Summer 2002). "A Response to Christopher Ferrara". Latin Mass Magazine. Retrieved June 10, 2010. ^ "2018 - Statistiques concernant la FSSP". Priestly Fraternity of Saint Peter. November 2, 2018. ^ "Presentation". Confraternity of Saint Peter. Priestly Fraternity of Saint Peter. November 1, 2017. ^ "Organization chart". What are we?. Priestly Fraternity of Saint Peter. June 9, 2010. Retrieved June 10, 2010. ^ "New District Superior for the FSSP". Una Voce Carmel. February 26, 2008. Retrieved June 10, 2010. ^ "About". Casa Cristo Rey. FSSP Mexico. September 2015. Retrieved March 23, 2017. ^ "FSSP in Mexico to Offer Spanish Immersion for Clergy". New Liturgical Movement. December 10, 2015. Retrieved March 23, 2017. Wikimedia Commons has media related to Priestly Fraternity of St. Peter. This page was last edited on 1 February 2019, at 13:38 (UTC).